Spinach/ Palak / Cheera is a super food loaded with tons of nutrients. 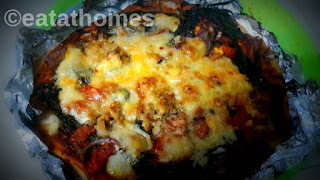 Spinach is one veggi you might never have thought of adding to pizzas, but i tried & the effect is fabulous! Heat the olive oil in a broad non-stick pan, add the onions and green chilies and sauté on a medium flame for 30 seconds. Add the spinach, salt and pepper, mix well and cook a medium flame for 1 minute. Add the fresh cream and paneer, mix well and cook a medium flame for 1 minute. Keep aside. Divide the spinach topping into 2 equal portion. Keep aside. Place a pizza base on a clean, dry surface, spread 2 tbsp of tomato ketchup and spread it evenly. Spread a portion of the spinach topping and spread it evenly. 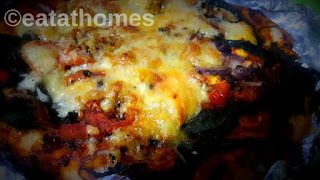 Top with a few sliced red capsicum, sliced yellow capsicum, sprinkle little salt, pepper powder and ¼ cup of cheese. Finally sprinkle red chili flakes and dried oregano evenly over it. Repeat step 2 to 5 for make 1 more pizza. Bake in a preheated oven at 200°c for 15 . Bake min or till the base is evenly browned and the cheese melts. 1) You can skip cream. 2) You can add left over palak (spinach) paneer curry as topping.